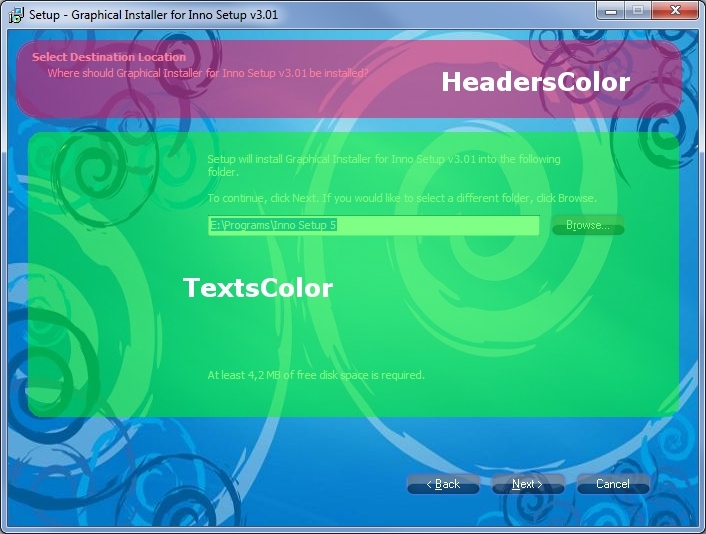 Graphical Installer contains many useful Functions, Procedures and Variables which may be handy when you want to change certain feature of installer or add a new one. Most of these snippets belong to [Code] section as they are Pascal based. Handle: HWND - TNewProgressBar Handle. Foreground: String - Foreground color of progress bar (Format: $RRGGBB). Background: String - Background color of progress bar (Format: $RRGGBB). Note: This procedure uses String parameter for colors ($RRGGBB format), not TColor! To colorize the progress bar on Installing page (wpInstalling) use the WizardForm.ProgressGauge.Handle as HWND parameter. Handle: HWND - Page (or Form) Handle when button should be placed. Left: Integer - Button Left position (in pixels, relative to parent!). Top: Integer - Button Top position (in pixels, relative to parent!). Caption: String - Button text. ClickEvent: TNotifyEvent - event executed when the button is clicked. HWND: Handle to created button (0 on error). To place button on certain page use correct Handle (HWND). Wizard form is a little complicated as they are several components placed over themselves. The most common is using the WizardForm.InnerPage.Handle as parameter. Handle: HWND - Button Handle. Value: Boolean - Button visibility (True = Visible, False = Hidden). Call this procedure from procedure CurPageChanged(CurPageID: Integer); to show or hide button in desired page.